The Arcata Police Department is seeking assistance in locating Jason Francis Lovell, 32 of Arcata. 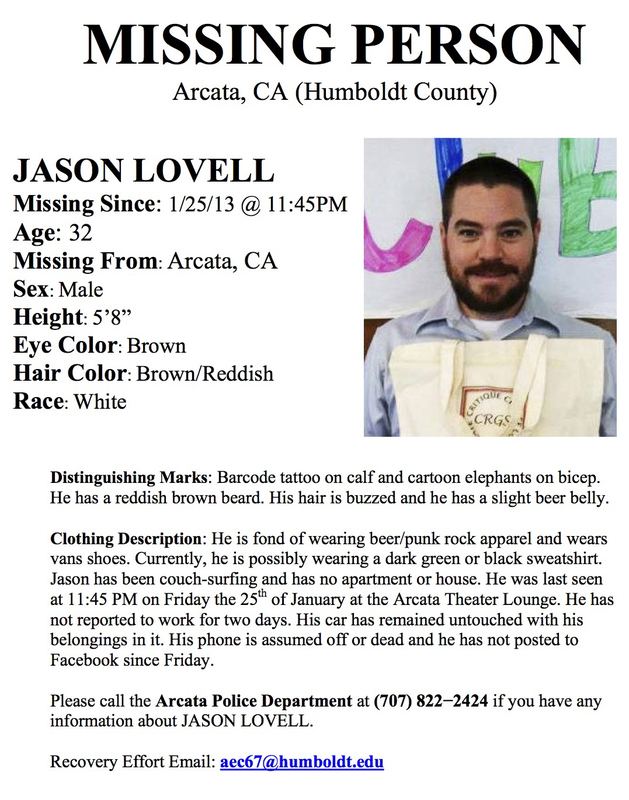 Lovell was reported missing on Jan. 29, 2013. He was last seen on the evening of Jan. 25 in Arcata. Family and friends became concerned when Lovell failed to show up for work. His vehicle was found abandoned in the 1200 block of F Street. Lovell has a history of mental health issues and is considered at risk. Lovell is described as a white male adult, 5’8″ tall, weighing 150 lbs with short brown hair and hazel eyes. He has a short reddish brown beard. Anyone who has seen Mr. Lovell or has any information as to his whereabouts is asked to call the Arcata Police Department at (707)822-2428. This entry was posted on Wednesday, January 30th, 2013 at 4:09 pm	and is filed under News. You can follow any responses to this entry through the RSS 2.0 feed.